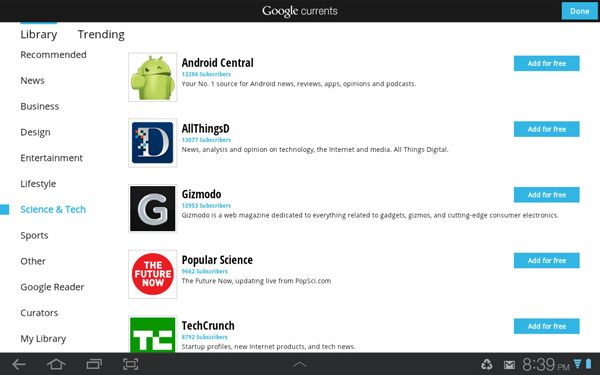 Google Currents, a Flipboard competitor, was just released for both Android and iOS. The app brings publisher editions of the web or your blogs and feeds on your phone and tablet. It features magazine style UI in a clean format with offline support and syn across devices. Publishers can customize their editions and bring unique content in new format to users. 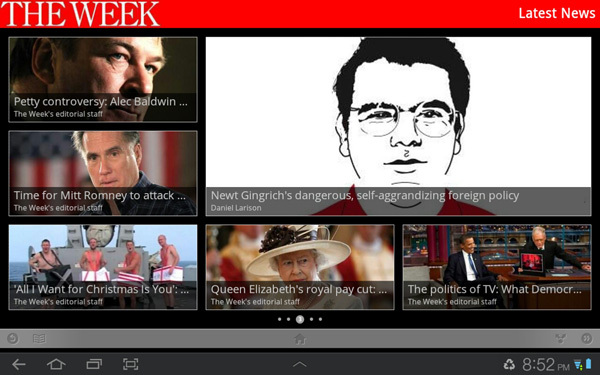 Browsing through the app on my tablet, I was really impressed with the overall layout and feel. Google has made a solid product which I’ll be using daily. The Google Currents home screen is split in half with one side featuring an image slider and the other side displaying categories of Library and Trending. The trending sections uses Google Search to show the top 5 stories by categories that you can choose. The Library displays all the publication that you have chosen to follow with their latest articles automatically downloaded and made available offline. You can choose when offline downloading occurs and if images are included. Each publications will look slightly different based on how the publishers set it up and whether on a tablet or phone. On the tablet, the publication will display photo banners of the articles in different sizes. You can flick left and right through the different stories or use the table of contents. When you choose an article, you also flick for the next page and when you reach the end flicking will take you to the next article. At the end of each article there is an option to view the original article which is displayed though an in-app browser. A nice option but the whole point of the app is to consume the new web in a new format. 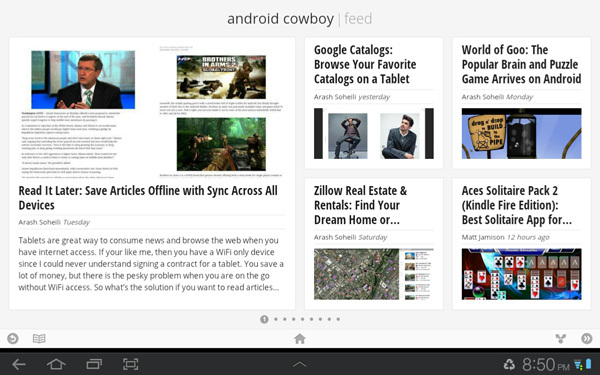 All articles can be shared to social sites or other apps using the Android share option. 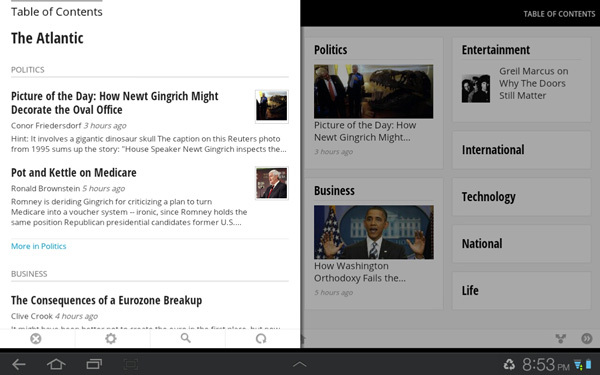 Overall, Google Currents provides a visually appealing and clean format to consume news and information from the web. One of the best features is the offline reading which is performed automatically so your content is there without taking any action. All publication are provided for free but no doubt paid content will be added in the future. The fact that publishers can customize their edition is an important factor that can pave the way for paid subscriptions and to differentiate it from the web and print magazine. This is a great app, so download it and get your content while it’s all free. Find us on Google current by searching “Android Cowboy” or follow this link on your mobile browser.